December 2018 Update: This recipe was originally posted in 2012, and was recently updated to make improvements and clarifications based on reader feedback. Thanks for reading! 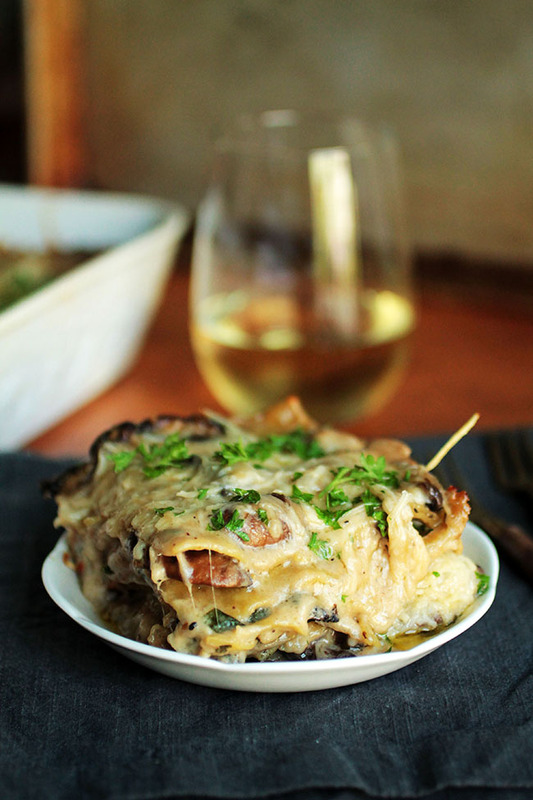 A long, long time ago (ish), back when I was just beginning to learn the ins and outs of this blogging thing, I posted one of my faaaaaavorite recipes in the entire world (that’d be this Mushroom and Spinach Lasagna, HELLO DELICIOUS) on Life As A Strawberry. Looking back at these old pictures now is a little traumatizing for me (“Why did I ever put that on the internet? !”), but it’s also a nice reminder of just how much I’ve learned and how far my little corner of the internet has come in the last three years. It’s too easy to lose yourself in to-do lists and future goals – sometimes you need to take a step back and appreciate the things you’ve already accomplished. I struggle with this a lot, but I have to remind myself that it’s ok to pat myself on the back sometimes, and it’s ok to look at something I did and be proud that I did it. Learning to use my camera, like, really use it? That was big! And recognizing the bigness of some things already done helps the future things seem a little less daunting. That whole make-things-less-daunting thing has been especially important to me lately. Making a go of full-time blogging is wonderful and fun and freeing and rewarding – but it’s also stressful. Suddenly, things like recipe development and new income streams and photo quality feel a lot more urgent. And sometimes that pressure gets to me a little bit. There are days when I test five or six recipes and they all turn out terrible. There are days when I’m convinced this is a ridiculous idea and I should go get a “real” job. There are days when I don’t feel like I have any original ideas left in my noggin. And on those days, I like to go back to basics. To make some serious comfort food without writing down the recipe as I go. To make the kind of food that made me love food in the first place. So here’s a new, refreshed version of an old favorite. Just as tasty and easy to make as it was three years ago – but with photos that do it a little more justice. I guess this is my thank you note to the lasagna (and to you, lovely internet friends!) for sticking with me all these years on this strange but super fun journey. Make it when you’re focusing too much on big things ahead and need some comfort food of your own (or, y’know, next time you’re hungry) and take a minute to remind yourself that YOU = AWESOME AND ACCOMPLISHED, and that next big thing on your list? You’re totally gonna crush it. 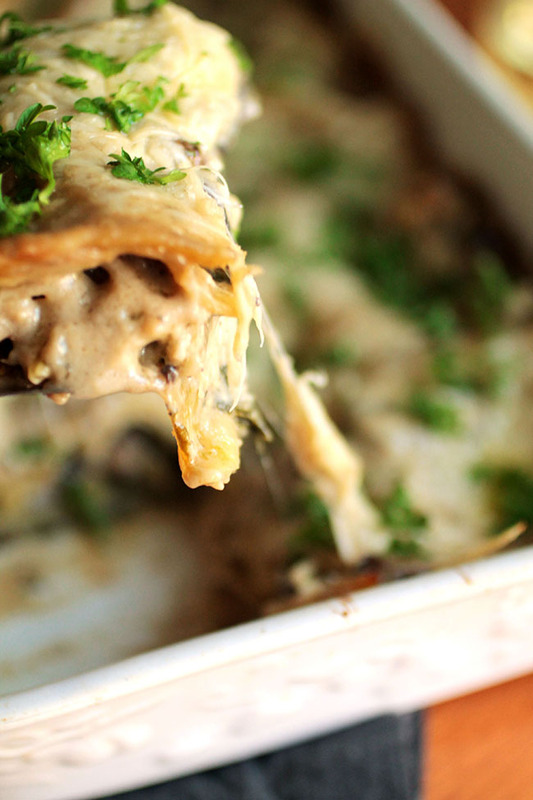 An easy mushroom spinach lasagna recipe with a light parmesan cream sauce. 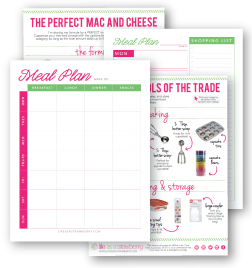 Freezes well – perfect for make-ahead meals! If you’re using dried lasagna noodles, cook them according to package directions in very salty water until 5 minutes less than al dente. Drain and set aside. I recommend laying the noodles out in a single layer on a lightly oiled baking sheet as soon as they’re cooked – it keeps them from sticking together so they’re easier to work with later! (If you’re using ready-to-bake noodles, you can skip this step – see recipe notes). Heat a large saucepan over medium-high heat. When pan is hot, drizzle in the olive oil. Add onion and garlic to pan and stir to combine. Cook 1-2 minutes until onion has begun to soften. Add sliced mushrooms to pan and cook, stirring occasionally, for 4-5 minutes until onion is translucent and mushrooms have reduced in size. Add salt and pepper to taste and stir to combine (don’t skimp on the seasonings here – salt is what brings out the flavor! I usually add up to 1 tsp. of kosher salt at this step). Add flour to saucepan and stir to combine. Let cook for 30 seconds or so to ensure the flour cooks through. Add the vegetable stock to the pan a little at a time, stirring as you go to break up any lumps of flour. Bring mixture to a simmer and cook, stirring occasionally, for 8-10 minutes until sauce has begun to thicken. Turn off the heat, then add spinach and 2/3 of the parmesan cheese to the sauce (save the last cup of parmesan cheese for topping the lasagna!). Stir until spinach has wilted and cheese has melted into the sauce. Taste the sauce! Grab a spoon and steal a bite – then add extra kosher salt or pepper as needed. (I almost always add another 1/2 teaspoon or so of Kosher salt during this step). Heat oven to 375 degrees F (if you plan to bake your lasagna immediately – if you’re freezing it for later, you can skip this step). Spread a thin layer of sauce over the bottom of a medium-sized baking dish (I use an 8×10″ dish – see recipe notes). Put down a layer of lasagna noodles, followed by a few ladlefuls of sauce, followed by a few slices of mozzarella cheese. Repeat until you run out of noodles and sauce. Top the final layer with any remaining mozzarella cheese and the rest of your parmesan. Bake lasagna for 30-40 minutes until cheese has melted and the edges are lightly browned. (If you’re freezing the lasagna or making it ahead of time, skip this step and see recipe notes). Let lasagna cool for 10 minutes before serving. Top with fresh parsley, cut, and enjoy. This post was originally published in 2012. The recipe instructions and ingredients were updated for clarity and quality based on reader feedback and additional testing in 2018. This is a great base recipe – make it as-is or add some extra things to make it a little heartier! Shredded chicken, leftover Thanksgiving turkey, and sausage are all great protein options. You can also add any veggies you have on hand: I like bell peppers, broccoli, carrots, tomatoes, asparagus, or brussels sprouts in this recipe. 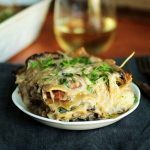 To use ready-to-cook lasagna noodles, I recommend adding an extra 1/4 cup or so of vegetable stock to your sauce – ready-to-cook noodles soak up more liquid, so an extra splash of liquid helps them stay moist! 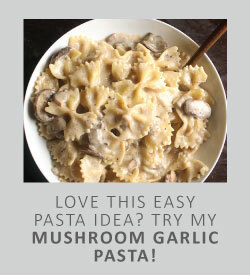 I’ve had good luck making this recipe with ready-to-cook noodles and you can absolutely make that swap if you like. To make this lasagna ahead of time, you have a few different options. The assembled lasagna freezes well, but the sauce also freezes well on its own. To freeze or refrigerate an assembled lasagna, let it cool completely and wrap tightly with plastic wrap. Lasagna can go straight from the fridge or freezer into a COLD oven (let the oven heat up slowly with the cold dish already inside to prevent any ceramic or glass dishes from breaking) and bake for 1-2 hours until cheese has melted and lasagna has cooked through (refrigerated lasagna will generally only take an hour when you start it in a cold oven; frozen lasagna will take a bit longer). I usually use an 8×10 casserole dish for this lasagna, which typically holds 3-4 layers of noodles and sauce. You could use a 9×13 dish if you like (you may just need fewer layers – but you can always stack a few slices of lasagna on top of each other for that sky-high look!) or use a smaller baking dish for more layers and taller lasagna. Use 2 cups frozen spinach in place of fresh spinach if you like. Use a high-quality parmesan cheese in this recipe if you can find it, and stay away from pre-shredded if at all possible: pre-shredded cheese is often treated with preservatives that prevent it from melting smoothly into a sauce. Strict vegetarians can opt for a vegetarian parmesan cheese made without rennet. it was sooo yummy! Only complaint is that I wish there was more sauce so I could do more layers! But it was sooo good! & my husband loved it too! 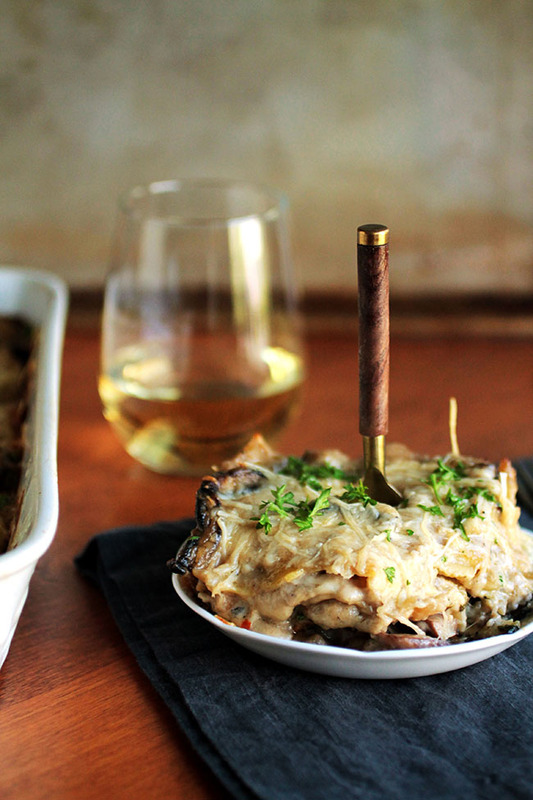 I have made this recipe a few times now and it is so delicious. I do always end up having to double the sauce recipe to make enough for my liking but it is so good! Even the picky toddlers will eat it!